Denali is incredibly difficult for a few reasons. First, the weather there is always unpredictable. 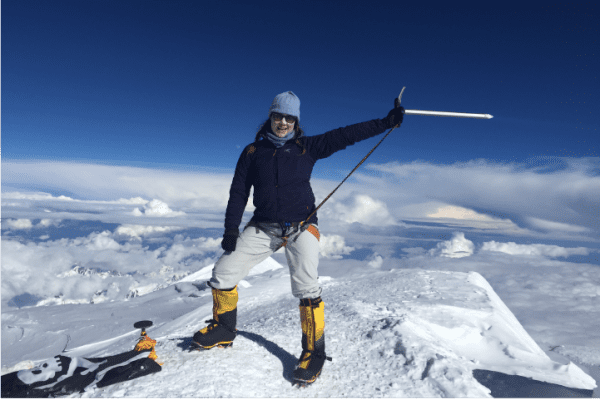 Once you’re there, you need to wait for a clear weather window, and as I learned on Aconcagua, you need to accept that weather is completely out of your control. Of the seven, I knew this was one was likely to require multiple attempts. We were caught in a snow storm for 11 days, with nothing to do besides shoveling snow off of our tents. I learned a lot about how important self-care is on this climb. Our packs were also the heaviest on this climb, and we needed to carry them for 21 days. I’ve never carried so much weight up steep hills like this. You not only have your personal gear, you also have the group camping gear and food. I wore my Arc’teryx Proton jacket the entire time. The warmth to breathability ratio was perfect for the climbing conditions. 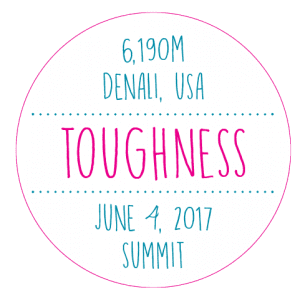 Denali is also the most technically challenging summit. My most memorable time was climbing along the ridgelines. The ridgelines have steep drops on either side of you, with just a thin path to walk on top of…thrilling but dangerous! On summit day, there’s no room for mistakes. If one person fell, you could all go down. The view from the summit was spectacular!